Andrea's World Reviews: Borax Soap GIVEAWAY! I know how much you all love giveaway, especially for practical(necessity) items, so I want to share this awesome review/giveaway from my friend Lori with ADayinMotherhood.com. Enjoy! Have you ever heard of Borax? I really had not. But now, I am a true believer and will have it in my house all the time! 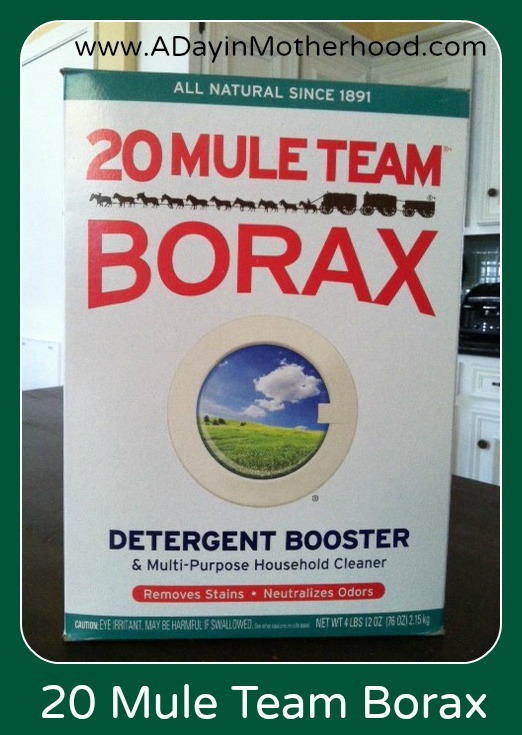 20 Mule Team Borax is 100% natural mineral from the Earth. It is removed from the ground, washed, dried and boxed. There are no additives, no phosphates and no chlorine or chemicals added! It is used in laundry to help reduce the affects of hard water - which I deal with a lot - and it helps keep stains from redepositing onto clothes while washing. I used it with my Purex detergent the other day while doing laundry. Curious to see if adding 1/2 a cup of 20 Mule Team Borax to every load would make a difference in the softness and cleanliness of my clothes. Something that is super important with kids! So I tossed in some soiled clothing from the sandbox, added the Borax and washed the load. Now, I will say, I could not tell the difference right away but the dirt stained knees of my kids jeans were gone and the clothes smelled soft and clean! So far, I am liking this additive to my laundry! And I like that I can use it in my kitchen and bathroom too to help clean and deodorize! Now, onto the Borax - Fresh Year, Fresher Laundry Facebook Sweepstakes! By clicking that link you can enter to WIN $1,500 from Borax or 171 FREE BORAX COUPONS!! Yes, the prizes total $2,013. Get it? The contest ends February 22, 2013! So CLICK THIS LINK NOW for the super easy entry form! Three (3) of our readers will have a shot to win their own FREE Borax Product coupon just by entering below. Lori with ADayinMotherhood.com will be responsible for mailing these out to the winners! This giveaway ends February 22, 2013 also! Enter for your chance below and GOOD LUCK! I've been loving borax since my early childhood when my mom had me doing light loads of laundry! Mud is the worst! !